This is what I know: It is grown in Hawaii, but originally from Puerto Rico, in Puerto Rico no one heard of this variety. In other parts I have read it originated in Hawaii. It is mentioned in this document form Hawaii University. Its fruit matures in the fall and winter. That is my interest. Not much about it in the internet. If you grow this please let me know. The graft has taken and is growing very well. I'll use it to top-work a tree in 2012-2013. I have not been able to find a picture of the fruit. Not to be confused it with the Miguel avocado, a widely cultivated commercial variety on South Florida. March 24, 2012; One thing I can tell at this point is that this tree likes South Florida. The graft took off like I have never seen before. True, it was grafted on a two year old seedling in a 5 gallon pot. That helps but the strength, the symmetry, the color, the branching of this tree is incredible. I hope it fruits like it grows, I may be pleasantly surprise. May 25, 2012: This tree is doing so well that I prepared but wood by cutting the ends, once the bud wood was ready I grafted it into a tree that I had bark grafted and those failed. It had 3 good water shoots so I grafted the Sam Miguel. If this works, it will accelerate the process of tasting this fruit. December 26, 2012. I top worked a tree as indicated above and also in September I added new grafts on new water shoots. All took, seems that this variety likes to graft well with West Indies. As result the tree is on its way for next year. See picture dated today. December 21, 2013: The tree is nice size for the first year. It getting a little crowed by a Nishikawa next to it that is a year older. It is beginning to build flower buds. December 31,2013: I wanted to get a larger view of the tree and also check the flowering process, seems like it could flower soon. The tree is holding its space, specially after I pruned the Nishikawa. February 14, 2014: The tree is building flower buds and is also pushing leaves, I think we are getting a combination of both. Not sure what is going to do. I heard from someone in the fruit nursery business who said he had a tree that fruited and the fruit was very susceptible to scab. I asked if he sprayed the tree and he said no. He also did not remember the quality of the fruit. So we wait until we test and arrive at our own conclusion. July 4, 2014: There are some fruit in the tree. Hard to see how many because of foliage. Clearly a late fruit because of current size in July. See above picture taken today. October 11, 2014: I thought the tree had dropped all the fruit but I did find 3. They look good. The tree's foliage hides them well. They seem well into a lb or more. I'm not sure one has to wait to pick these until the skin starts to turn black. See today's pictures. I think the one on top will go first. October 26, 2014: Tasted one of the San Miguel today for lunch. What a pleasant surprise! It was clean, creamy, and great taste. One of the best avocados I have tasted this year. I hope once it get past the juvenile stage we can get more fruit out of this tree. It was a surprise because a local tropical fruit nursery said he had a tree and he did not like it. Too watery and full of scab. This was not it. This is an outstanding avocado. October 28, 2014: This tree does not want to hold fruit past October. The other smaller fruit was found on the ground today. Did not turn dark, only a slight color change. Next year, it can be picked later September early October. 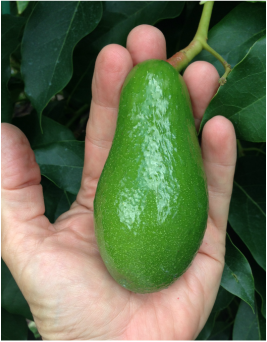 May 16, 2015: Seems like the San Miguel avocado is on track for a good crop. Nice fruit set.Strong tree good foliage should see most of the fruit to term. June 13, 2015: No doubt this tree set a lot of fruit, now they are getting bigger and you can see them better. This is a high producer. Looks like a wide tree. Could be a good mid season choice. October 18, 2018: This tree has a short season. As soon as the neck of the fruit gets a little red the fruit drops a few days later. the tree is dropping a lot of fruit. they are also small. What attracted me to this tree was reports from Hawaii that is was a late season fruit. October is not quite late for me. It was other undesirable characteristic: small fruit, short picking season and susceptible to disease. Flavor just OK. I picked fruit today to remind me of the flavor. It came in at 8 oz. I think I have no use for this tree.